Jewish National Fund held a cocktail reception that was generously hosted by BNY Mellon Wealth Management. David Lehrer, Director of the Arava Institute for Environmental Studies, came from Israel and spoke about the Institute’s work to bring Jews and Arabs together on environmental and sustainability initiatives. More than 100 guests came and learned about the Institute’s dedication to training a new generation of environmental leaders. The Arava Institute for Environmental Studies (AIES), located on Kibbutz Ketura in the Negev, is the Middle East’s premier center for environmental education and research. The Institute was founded on the principals of international cooperation, partnership and coexistence. AIES brings together Israelis, Palestinians, Jordanians and students from all over the world to study the unique environmental challenges of the Middle East. Studying, researching, and living together, the students share common needs, interests and environmental concerns, and in that way, they are encouraged co-exist while striving toward a common goal. AIES is the first teaching institution that brings together such a broad range of students, professionals and international colleagues to work towards peace and a sustainable environment in the Middle East. The Arava Institute also hosts Israel Ride, a five-day cycling adventure from Jerusalem to the Mediterranean coast, across the Negev, and ending at the Red Sea. The 300 mile ride promotes peace, partnership, and environmental protection. The next ride is scheduled for October 19-26. For more information, or to participate, visit www.israelride.org. 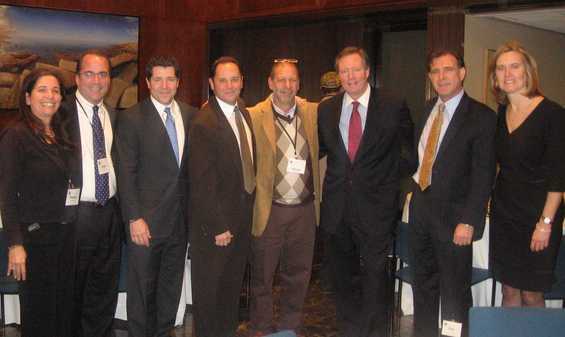 Picture Caption: (L to R): Sharon Freedman, Brian Nagle, Managing Director of BNY Mellon Wealth Management Thomas Dicker, Jeffrey Davis, David Lehrer, Richard Noone, Robert Cohan and Regional President of BNY Mellon Wealth Management Vicary Graham.